The FIAT® 500X Lounge equips you richly with comfort, style and technology. On the outside, bifunctional headlamps and cornering fog lamps bring more style to its fun Italian design. Inside, leather-faced seats, 5-inch touchscreen, 3.5-inch customizable in-cluster colour display, SiriusXM satellite radio with one-year subscription9, dual-zone automatic temperature control and ParkView® Rear Back-Up Camera14 all come standard. All-wheel drive is available for added handling prowess. The authentic FIAT® style runs deep in the all-new 500X. Designed at the FIAT Centro Stile studio in Turin, Italy, the double headlamps, trapezoidal nose and rounded clamshell hood pay homage to the original Cinquecento. Inside, premium interior craftsmanship and soft-touch surfaces combine with an ergonomic layout to deliver the fun, Italian design you expect from a FIAT. The impressive utility of the 500X is showcased by a total cargo volume of up to 563.5 L (19.9 cu ft) with the rear seats folded. That space is made even more versatile by a height-adjustable rear cargo floor, fold-forward front passenger seat, 60/40 split-folding rear seat and numerous storage compartments. The FIAT® 500X interior is stylish and comfortable. Dual-zone automatic temperature control, heated front seats and steering wheel, premium trim options, and 12-way power driver's seat including 4-way lumbar adjust are just some of the features available. The available panoramic dual-pane sunroof provides picturesque views from every seat. The side glass panels match the body-side sheet metal creating a wide and spacious effect. A manual sunshade is included to adjust the amount of light inside. Every FIAT 500X comes standard with a 3.5-inch customizable in-cluster display, Uconnect® 3.0 multimedia centre, and media hub with USB port and auxiliary input jack. From there, choose from available features like hands-free communication13 with Bluetooth® streaming audio, larger 5- and 6.5-inch touchscreens, navigation17, and BeatsAudioTM premium sound system. The FIAT® 500X is packed with advanced technology to give you exceptional fuel economy wherever you go. Both engines utilize MultiAir® variable valve timing to increase overall efficiency, while the available 9-speed automatic transmission allows for a multitude of shift maps and shorter steps between gears. The available all-wheel drive system also saves fuel with an innovative rear-axle disconnect. This intelligent feature only powers the front wheels until full traction is needed for an impressive balance of performance and efficiency. A 1.4L MultiAir® I-4 Turbo comes standard on Pop, Sport and Trekking front-wheel drive models delivering 160 horsepower and 184 lb-ft of torque. On the Lounge, Trekking Plus and all models equipped with all-wheel drive, you'll find the 2.4L TigersharkTM MultiAir I-4 engine with 180 horsepower and 175 lb-ft of torque. Both engines use advanced MultiAir variable valve timing technology to maximize performance and fuel efficiency. The FIAT® Dynamic Control Selector gives you the choice of 3 modes to adapt the performance of the 500X. Auto is calibrated for everyday driving by optimizing fuel economy and comfort. Sport heightens the engine calibrations for more responsiveness, while Traction+ maximizes low-speed grip on traction-limited surfaces by allowing additional wheel slip. A direct and refined 6-speed manual transmission is mated to the 1.4L MultiAir® I-4 Turbo. The 2.4L TigersharkTM MultiAir I-4 engine is paired exclusively to an advanced 9-speed automatic transmission. With 9 gears, it has more range to optimize power delivery and fuel economy, while providing a more responsive driving experience. The 500X is the first-ever FIAT® to offer all-wheel drive (AWD) for confident handling in all conditions. It utilizes an innovative rear-axle disconnect to increase overall fuel economy by only powering the front wheels when all-wheel capability is not needed. AWD is available on Sport, Trekking, Lounge and Trekking Plus. The available Lane Departure Warning with Lane Keep Assist14 has the ability to alert the driver visually and physically via a slight vibration in the steering wheel if it detects the vehicle is drifting out of its lane unintentionally. If the driver doesn't respond, the system can automatically realign the vehicle to the proper lane position. The available Forward Collision Warning with Active Braking14 can detect if the 500X is approaching a vehicle or larger obstacle in its path too rapidly. When that happens, the system provides audible and visual warnings, and can also assist by actively applying the brakes to slow the vehicle before a potential impact. During lane changes, the available Blind-Spot Monitoring14 will alert you with an audible chime and illuminated icon in the side view mirror if there's a vehicle in your blind spot. It also includes Rear Cross-Path Detection14, which keeps you safe by detecting vehicles approaching from either side when you're reversing out of a parking spot. When in Reverse, the available ParkView®Rear Back-Up Camera14 displays an image of what's behind the vehicle on the touchscreen, and uses dynamic gridlines to steer you safely into place. The available Park-Sense® Rear Park Assist14 gives you a visual reference in the in-cluster display, along with an audible chime that increases in intensity as you get closer to a potential obstacle. 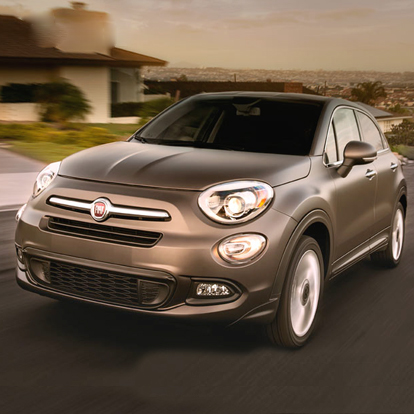 TAKE THE 2016 FIAT 500X LOUNGE FOR A SPIN!